Rose Zhang, 14, struggled with her health while competing in the 2017 Rolex Girls Junior Championship, played at The Biltmore Forest Country Club in Ashville, NC. The Rolex, was played June 12-16, 2017. Rose, shot 72-74-69-76 (291) to finish in 17th place. Rose’s, opening round 72 put her into a tie for 10th place in the event that has the top 72 player’s in the world, vying for the prestigious championship. Rose, shot 36-36 and posted 3 birdies and 3 bogies in her opening round. The second round 74, consisted of 4 bogies and only 2 birdies and left her in a tie for 11th place. As the week went on, Rose, begin to feel sick and run a fever that was in the 101-102 range. 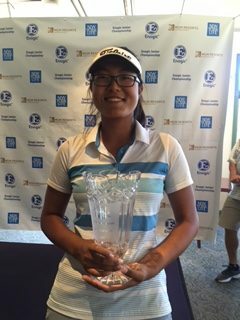 Although the young player from Irvine, CA., did not feel well, she posted a solid third round 69 that was made up of 3 birdies and 15 par’s. The 69, moved her into a tie for 7th position going into the 4th and final round. As luck would have it, Rose’s fever, stayed up and she began to feel the effect of her increased body temperature. She finished with a 76 that was made up of a birdie and 5 bogies (uncharacteristic of the #1 14 year old in the country) that left her in 17th place. Still, a strong tournament, but not exactly what Rose, had in mind. Meanwhile, Crystal Wang, finished in a tie for 22nd place with round’s of 78-72-73-71 (294). Crystal opened the Rolex with a mix of 3 birdies, 7 bogies and a dreaded double bogie, that left her in a tie for 37th place. The second round was more kind to Crystal, as she shot an even par 72 with 2 birdies and 2 bogies. Crystal, moved up into a tie for 29th place with her even par, second round. Her third round had 2 birdies, a bogey and another dreaded double, that left her in a tie for 28th place. Crystal’s final round got off to a terrible start with 3 bogies on 1, 2 and 3. She birdied 4, bogied 6 and finished with a rather pedestrian 39. CW (Crystal), started the back side and final hole’s with 3 par’s. Lightning struck, and CW, played the back 9 in 32 (-4). She birdied 13, 14, 16, and 18 for a 39-32 (71), and move herself, into a tie for 22nd place. A great comeback for Crystal, who has committed to the University of Illinois, for the fall of 2018. Congratulation’s to Rose and Crystal for a good showing in one of the premier AJGA Invitational’s of the year.